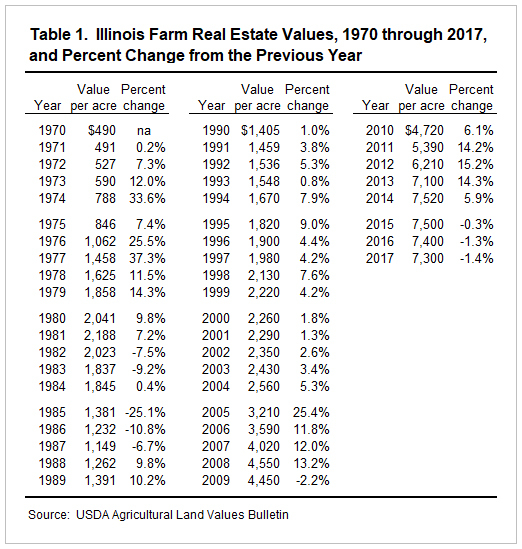 The average Illinois farm real estate values from 1970 through 2017 are listed in Table 1 and graphically in Figure 1. The average farm real estate value for Illinois in 2017 was $7,300 per acre. This includes the value of all land and buildings. The figure was 1.4 percent lower than the 2016 average of $7,400 per acre. The 2017 decrease is the third straight year for a decrease, but only the fourth decrease since 1987. 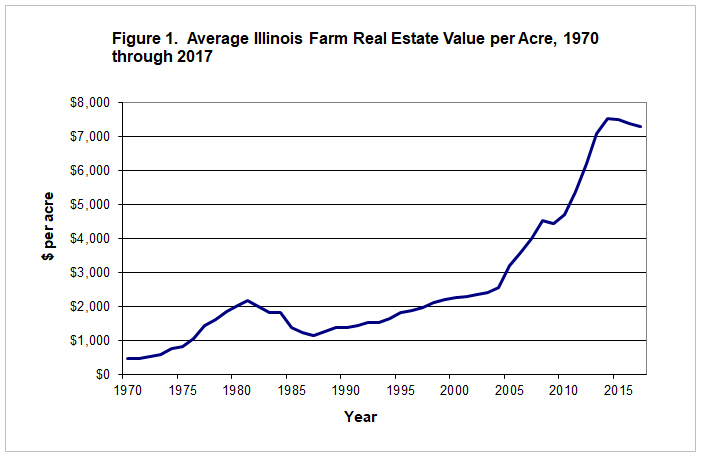 Even with the slight decrease in the last three years, Illinois farm real estate values for 2017 was 60% higher than the 2008 value of $4,550 ten years ago. Since 1970, average farm real estate values have declined only eight times as compared to the previous year. Those years were 1982, 1983, 1985, 1986, 1987, 2009, 2015, 2016 and 2017. The last time there were three years in a row with a decrease was 1985, 1986 and 1987, however the decreases in 2015, 2016 and 20176 were very small compared to those years. There have been four years when farm real estate values increased over 20 percent, in 1974, 1976, 1977 and 2005. The largest increase was in 1977 when values rose 37.3 percent.